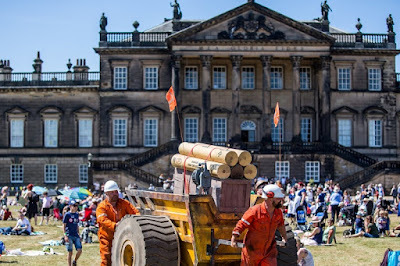 Generous local companies are being urged to support Wentworth Woodhouse fulfill its "wishlist." The CEO of the preservation trust restoring the Rotherham stately home to its former glory is appealing to businesses to upcycle or donate desperately needed items. The Wentworth Woodhouse Preservation Trust (WWPT) concluded the acquisition of the largest privately-owned house in Europe for £7m last year. The aim of the trust is to preserve the Grade I listed house and grounds on a long term sustainable basis and raise funds for repairs and other essential works. Sarah McLeod, CEO of the WWPT, said: "We have a long list of equipment which would help us greatly, but it's early days for us and we can't afford the vital pieces we urgently need. "We're not proud - we will gladly take secondhand donated items. We suspect many of things on our wishlist could be lying redundant at a builder's or engineering firm and promise we will put them to great use." Top of the wishlist is a secondhand Kubota mini cart, or a redundant golf buggy, which could be used to transport elderly visitors around the grounds and enable staff to ferry equipment needed at outdoor events. Currently the only way is for a "chain gang" of staff to pass items down the line. A fork lift truck is also on the list. McLeod added: "We have to carry everything by hand right now - including stock for our cafe and bars, building materials and refuse. That involves too many people, takes too much time and lifting heavy things is no good for our backs." A portable building is needed for the volunteers who are working hard to develop the gardens. Currently there is nowhere in the grounds for them to wash their hands, eat their lunch and take shelter in bad weather. And a supply of crowd barriers is required to keep visitors safe and protect heritage features at major events. Crowds are anticipated at a number of summer open air events - a production of Sense and Sensibility by Chapterhouse Theatre Company on August 30, movie nights featuring recent box office hit The Greatest Showman, starring Hugh Jackman, on August 24 and 26 and Eighties classic Dirty Dancing on Saturday August 25. A sponsored walk through the grounds and Fitzwilliam Estate to raise funds is taking place on Sunday September 30. Covering ten miles, all ages are encouraged to take part and raise a minimum of £20 in sponsorship.